Or: Why Warner Bros. isn't the best home for a classic sci-fi show. When the histories of this golden age of television are written, they will likely begin with The Sopranos. But that would be a mistake because the template a lot of modern-day TV copies was instead created by Babylon 5. A decade before The Wire would be hailed as a "novel for television," B5 was a hyper-serialized grand story that was conceived as a single five-year epic. If you're unfamiliar, Babylon 5 is about the inhabitants of a space station located in neutral territory between five major empires. After a series of brutal and devastating wars, the station was set up to help mediate peace between these powerful players. The first half of the year could be mistaken for a generic procedural drama but it's the ultimate "give it time" show, since things quickly begin to cohere into a much greater story. By the end of its five-year, 110-episode run, the show managed to tell a number of complicated stories, all at once. A show like Westworld can drag a simple piece of exposition out for nearly 20 hours; Babylon 5 would always resolve its plots long before you got bored of them. If the show had aired on HBO, with a HBO-level budget, it would be talked about in the same hushed tones as Game of Thrones. We should probably begin by outlining how effects-heavy shows like Babylon 5 are made, albeit simplistically. There are three different types of shot that were put together to make an episode. You have live-action scenes, which are just actors talking in a room; composites, which have a mix of live-action and CGI; and pure-CGI scenes. In order to protect your suspension of disbelief, it's important that you aren't noticing the transitions between them. A great sequence to explain Babylon 5's problem is the monorail scene from the Season 2 finale, The Fall of Night, which originally aired on November 1st, 1995. We begin with an entirely live-action shot, where Captain Sheridan (Bruce Boxleitner) boards a monorail shuttle. And you can tell, because it's framed properly and looks pretty good, even if the film is a little grainy because it hasn't been restored or remastered. Captain Sheridan (Bruce Boxleitner) in a live-action shot. When the shuttle pulls out of the station, we now see a composite shot, with CGI being used to provide the view out of the monorail's windows. You should notice that, instantly, Boxleitner's head is higher in the frame compared to a moment ago. And that the whole thing seems a little blurry, as if someone has zoomed in too far on a low-res image. A moment later, we switch to a far blurrier composite. The show's CGI sequences are in a similar condition to the composites, which you can compare with this slideover. Notice that the Aztec pattern -- the different textures on the ship's body -- looks far blurrier in the widescreen version. How did it get like this? Like many shows of its time, Babylon 5 was shot in widescreen (1.78:1) on Super 35 film, which was then cropped to a squareish (4:3) picture. The production team knew that high-def, widescreen TV was coming, and that there was the potential for the show to be re-sold in that format. So it was shot "clean," with sets and space either side of the action that could be shown in the event of a widescreen remaster. Another Warner Bros. show, Friends, was shot in the same way, although the production team wasn't so careful about shooting clean. 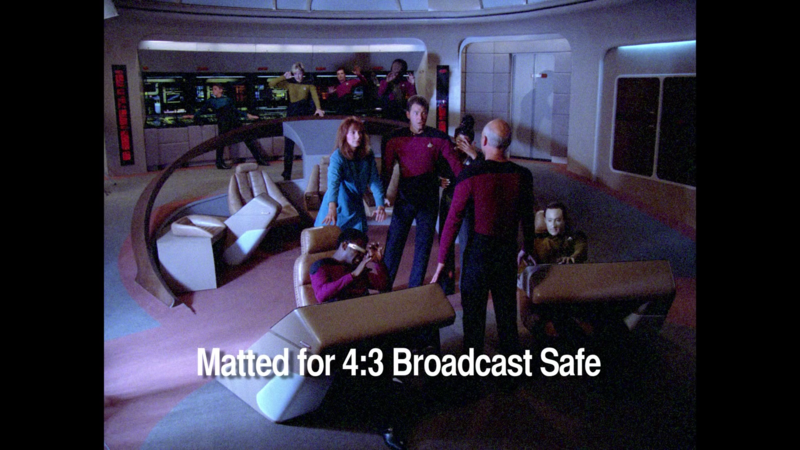 When the widescreen versions of the series were released, it didn't take long for viewers to spot crew members and gear in the periphery. Fox's Buffy the Vampire Slayer, which was shot on 16mm and 35mm film, was always intended to be shown in 4:3. An attempt to make a widescreen edition of the beloved cult show met a similar fate and angered creator Joss Whedon. Here's a compilation of all the times you can watch lighting rigs, crew members and even the edge of the set in the first two seasons of Buffy widescreen. Paramount Pictures' expensive remastering of Star Trek: The Next Generation had the same problem. The Blu-ray editions of the show are only available in 4:3 because just outside the frame are lots of studio personnel and gear. The creative team explained that it would be impossible to brush out this detail, and so the show remains in its original ratio. The issue with Babylon 5, however, isn't with its live-action scenes, but with any moment in the show that requires special effects. These days, no TV show is made without a lot of cosmetic enhancement from a small legion of CGI experts. But the early '90s were a different time, and most effects-heavy TV shows relied on expensive and time-consuming practical effects. 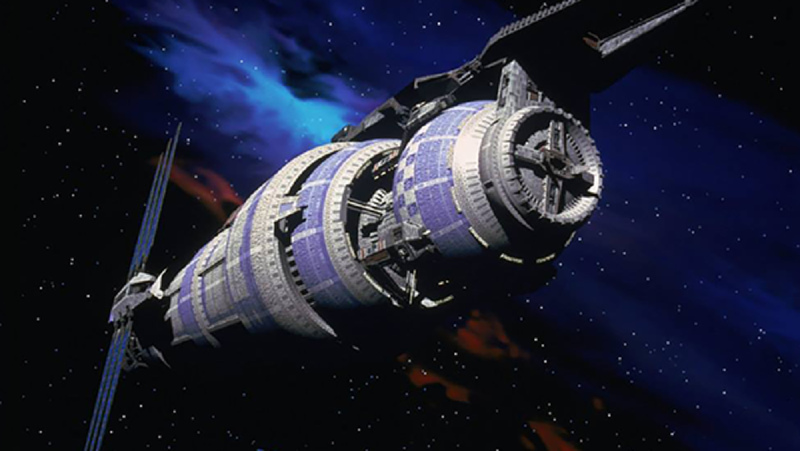 Babylon 5 used CGI a lot because it was the only way to make the show with its very tiny budget. And it was the early days of CGI, so early that the pilot episode's visual effects were produced on a network of Amiga computers. For the first three series, effects house Foundation Imaging used 12 Pentium PCs and 5 DEC Alpha workstations running Lightwave 3D. Now, according to some sources, Foundation Imaging lacked the time, or the resources, to produce widescreen CGI effects. 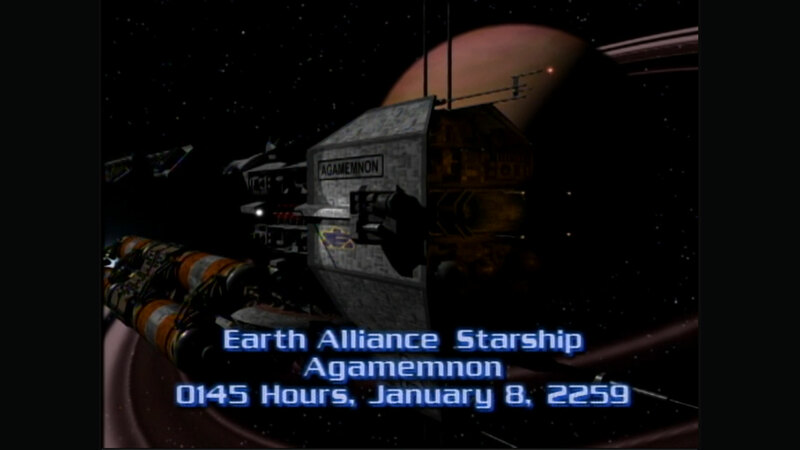 But that was okay, because the production process for Babylon 5 was to shoot 1.78:1 footage, crop it to 4:3, and then edit it with the CGI footage and composites for a completed edition of the show, ready for broadcast. "Halfway through the third season, Portugal and Belgium bought the show," explains producer John Copeland, "and they wanted it letterbox, because they knew we had shot it that way." He says that the Warner Bros. Advanced Tech Center had hurriedly "played with the visual effects" to get it to match the widescreen footage. Later, when the show's second-run rights to the Sci-Fi channel, "[Warner Bros.] transferred all of the PAL masters back to standard def, but shown in the 16:9 letterbox." Unfortunately, the CGI and composite elements only existed in 4:3, and so Warner Bros. decided to crop and stretch those sequences. That involved chopping the top and bottom off every frame in a scene, and then increasing its width to fit the aspect ratio. The issue was explored in detail by Henrik Herranen from Finland, who published How Babylon 5 Is Transferred to DVD in 2001. Herranen described himself as a "professional in signal processing and a video technique enthusiast." Unfortunately, attempts to find and contact Herranen failed. Herranen went on to say that because the video was interlaced, Warner Bros.' solution was to break down the image into separate fields. He believes that the components were then cropped wide -- losing a proportion of the data -- and then upscaled by 33 percent. The system then filled in the blanks as best it could, but because it's working with incomplete, low-res data, the results are poor. Later on, he explains that it didn't necessarily need to be this way, purely if the studio had spent more time on the conversion. Rather than cropping and stretching 4:3 footage to a 16:9 frame, the show could have just been letterboxed and then upscaled more generally. But Herranen says that the process would have required "automatic logic combined with some human interaction for verification," which would have likely increased the cost. Whenever you're looking at a film, you're basically watching a series of still images that, placed one after the other in quick succession, gives the illusion of movement. That's the same process used to create Progressive Scan TV, which is a common standard for a lot of digital content. 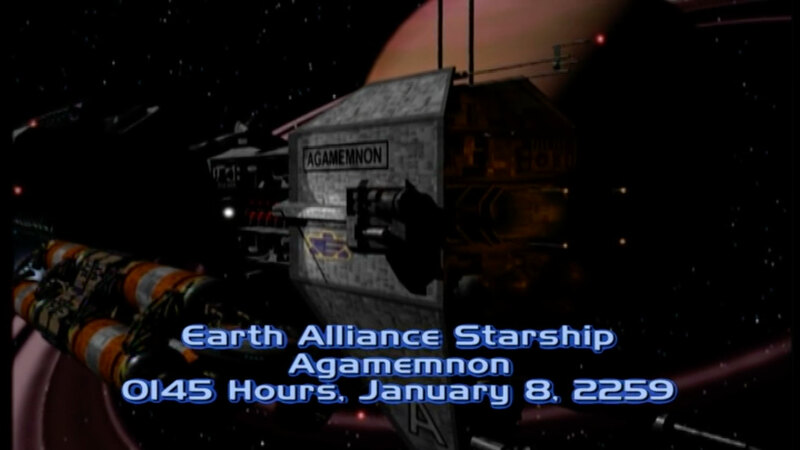 Interlacing, however, which is increasingly less common now, was how Babylon 5 was represented on video, and that's a problem. In order to understand interlacing, let's imagine that your TV screen is made up of, say, 1,080 horizontal slices. Slices one, three, five and so on are all members of Team Odd, while the even numbered slices are on the opposite team. Essentially, interlaced TV will update the pictures for each "team," one after the other. Every 1/60th of a second, these groups are refreshed, and should be fast enough for your eyes not to notice. Although, it's worth saying that it's easier to spot flickering and anomalies with this system because the image is broken down in this way. The result, unfortunately, is the jarring mish-mash of picture quality that bounces from good one second to pretty bad the next. Remember those screenshots from Season 2's The Fall of Night I used to demonstrate the problem? Some brilliant person on YouTube has uploaded an original, 4:3 version recorded off-air from a TNT re-run. The quality isn't great, but you should be able to tell that, as originally shot, it's a lot less jarring than the DVD version. Oh, and because people have complained, this video does contain a spoiler. For comparison, here's that same sequence in widescreen. It has been pretty hard, 25 years after the show was made, to track down those responsible for the show's digital second life. Several key figures from its history have passed away, retired, left Hollywood or we simply couldn't track down. Warner Bros., too, did not respond to our request for comment, and so cannot rebut anything that is said below. Foundation Imaging, which produced the CGI for the pilot through to season three, was apparently willing, and able, to produce widescreen effects. Co-founder Ron Thornton, who passed away in 2016, said that his company "offered to do all of Babylon 5 in widescreen." Quotes attributed to Thornton on the JMSNews forum point the finger over a fight regarding a $5,000 HD "reference monitor so we could check our output." That request was apparently denied, either by Ken Parks, WB's then-business affairs chief, or the show's co-executive producer Douglas Netter. Thornton went on to say that "each blamed the other," but the decision meant that "for $75 an episode, they could have had awesome, near hi-def." Unfortunately, it is difficult to verify his account, and Parks died in 2014 while Netter passed away last year. "There was not a breakdown over a monitor," John Copeland, who produced Babylon 5 and its sequel, Crusade, told Engadget. Copeland, now the owner of Rancho Olivos olive oils, says that "Ron [Thornton] wanted to get paid for re-rendering everything." And render time was the issue that forced every compromise when it came to making the show's visual effects. But Copeland feels Warner Bros. itself was the problem, rather than visual effects. "We had set up the show to make the transition to what was, at the time, called Advanced Television Technology," he said. "Everybody knew that [HD] was coming, and that the preferred format would be 16:9," and Copeland toured how other Warner shows were planning for the future. On Lois & Clark: The New Adventures of Superman, the team "were doing a 'video hack' to retransfer the negative, stretched in such a way that it would unfold in a 16:9 frame." Unfortunately, the results, while meeting the requirements for widescreen TV, "looked absolutely awful." So Copeland approached the studio and said that they would "shoot in a 1:78 (widescreen) format, and we'll compose for 4:3, but frame for 16:9." And at the end, the production team "gave them everything in two formats [4:3 and 16:9] with the exception of the visual effects." But, that wasn't a problem, because Warners' Advanced Technology Center had a plan to remedy the problem. "This company in Sweden, called Teranex, were way ahead of the curve in knowing people would need to upconvert standard def to high definition." Warners owned a Teranex box, and the idea was that, eventually, the 4:3 CGI sequences would be upconverted and integrated into the 16:9 footage. It wouldn't be perfect, but it would look pretty good. But rather than doing it, in the end WB simply reconverted the futzed Portuguese and Belgium footage to NTSC and sold it. The reason that the show was never given the proper Teranex treatment was, according to Copeland, "because they didn't wanna spend the money." He explained that in the days before DVDs were expected to be lavished with extras, home video departments just took existing material, slapped it in a box and reaped the rewards of doing so. Copeland believes that the two things that killed Babylon 5's second life were the fact that the show wasn't produced in-house by Warner Bros. "We were like the poor stepchild of Warner Bros," he said, "and the studio looked at us a little askance." In addition, archivists would "lose stuff all the time," including crucial film reels and resources needed before the episodes were broadcast. The other issue was Warren Lieberfarb, then the head of Warner Home Video, described by the Washington Post as the "father of the DVD." Copeland believes that "in 2002, when they started working on the DVD sets, it would have cost $1,200 to convert every episode and movie to high definition." But Lieberfarb "didn't wanna spend that," and so to save $132,000, the show was dumped out at low-resolution and forgotten about. That cash would have potentially been recouped simply through more DVD sales or potentially even a Blu-ray release. Copeland added that the relationship between the production team and Foundation Imaging broke down over an incident halfway through the third season. "We were doing Severed Dreams," that year's Hugo-winning blockbuster episode, "and Ron wouldn't deliver the shots for the show unless we gave him another $100,000 ...That was the point where we -- at Babylonian [Productions] -- sat down and thought 'if he does this once...'" Consequently the show walked away from Foundation at the end of the year. Netter's account is, however, disputed by those who knew Thornton. What, if anything can be done? Well, there's a Change.org petition (because there's always a Change.org petition). Otherwise, not a lot, because restoring a TV show is a pricey process that won't happen unless there's some guarantee of a return. Shows like Star Trek and The Next Generation were considered big enough properties to justify expensive restoration process. With streaming services destroying the physical media market, second-tier shows aren't likely to be seen as a good investment these days. 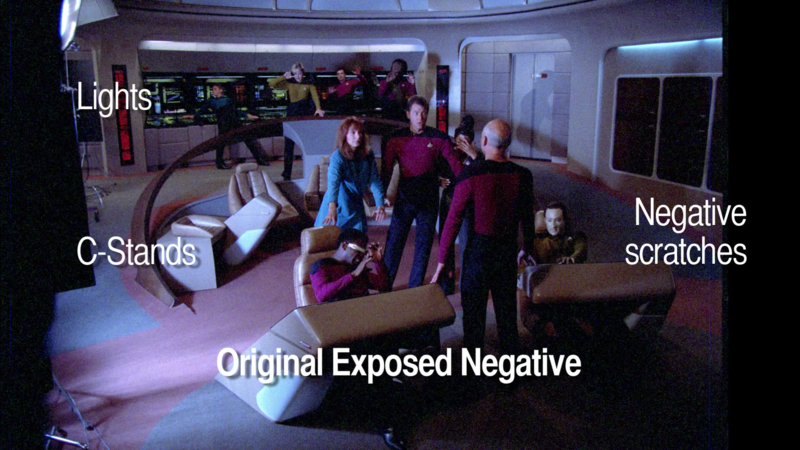 The TNG remaster, for instance, cost millions of dollars that it was hoped would be recouped for the Blu-ray release. But since the show is already available on Netflix, it's hard for folks to justify dropping hundreds of dollars on yet another physical media release. And the failure of the TNG project was enough to mean that we'll never see restorations of Deep Space Nine or Voyager. Some back-of-the-envelope math suggests that remastering Babylon 5 with brand-new CGI effects would cost at least $10 million. Since the original data has -- apparently -- been lost, it would take some time to recreate the images, although fan projects do exist that could speed that up. When (straight-to-DVD revival) Babylon 5: The Lost Tales was made, some fan-made models were used in the show. Even so, it's not likely that Amazon or Netflix would be willing to drop that sort of cash to fix Babylon 5's quality issues. There have, however, been attempts by fans to try and fix the problems that Warner Bros. introduced with the DVD releases. Hunt around on UseNet long enough and you can find people still sharing fan-made HD versions of Babylon 5 that have tried to fix the issues with the DVDs. They're hard to download these days, but some lucky people may be able to help you out. Babylon 5 is on Amazon Prime streaming now. Sadly the quality is... not good. My scan and convert jobs from the DVDs are sharper, even at the upscaled display size. @amazon thank you for adding Babylon 5! The show is one of the greatest ever! You should take @straczynski up on his offer for ways to up the quality. It deserves some love. On May 17th, Straczynski did offer a message of hope for fans of the series would require little to no effort on both Warner's and Amazon's part. In a five-tweet thread, he said that part of the production's deal with the studio required finished episodes of the show to be delivered on film. That means that there is a 4:3, theoretically pristine -- or at least better-quality than we currently have available -- version of the show sitting in a warehouse. The transfer would still not be pure high-definition, but it would have far fewer jarring transitions than what's currently available. John Copeland confirmed this, saying "They [Warner Bros.] have everything they would need, except for the pilot." (That's because the warehouse where the materials for the 1993 pilot movie The Gathering were stored were damaged by the Northridge earthquake.) "They could go back to the negative and, assemble the negative and re-transfer it in HD, and all they would have to do is upconvert the VFX footage and drop it into the holes." Of course, nobody should be watching Babylon 5 for the fidelity of its CGI, even if the cropping and blurring is a problem. As John Copeland said, "You're not really tuning in to watch the visual effects," instead, people are watching a two-decades-old show because "the storytelling does hold up." He added, "In TV, what makes you go back week after week, episode after episode, is that you wanna spend more time with the characters." And no amount of cropping and stretching can dim their shine.